This work presents the rare opportunity to witness the evolution of a field through the eyes of one of its principals. And it is our good fortune that he is also one of its most personable and gifted storytellers. The essence of the gift, in my view, is the unique ability to bluntly tell a difficult story with sensitivity and compassion. Tough issues are engaged with the necessary penetrating and no-holds-barred insight, but with a humanity that helps us to stay engaged as well. An onslaught of challenges without this compassion would be difficult to take. To the contrary, we leave his work with a clear sense of challenge, but accompanied by a sense that something can be done, and we as individuals have a contribution to make. His journey, some will say, mirrors that of the field. 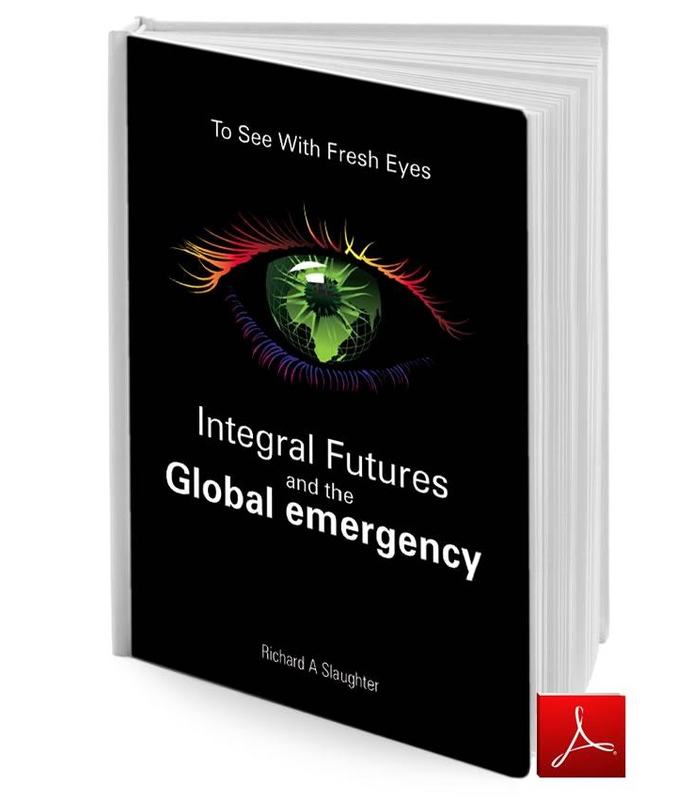 Indeed he has been at the forefront of two significant paradigm shifts in foresight: first, Critical Futures, and now, Integral Futures. He divides the work into three parts. Part One is the early works, up through 1995, where he first raises the idea of critical futures and the issue of a ‘defective world view.’ He will revisit that issue throughout his work perhaps most definitively in his most recent book The Biggest Wake Up Call in History. Part two covers 1996 to 2003 and includes the first foray into what becomes Integral Futures with his ‘Transcending Flatland’ piece, which for me marks the beginning of Integral Futures. 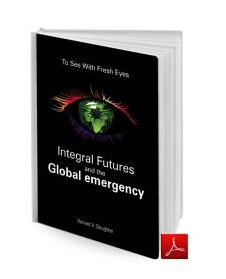 1 The third part from 2004 to the present focuses on his ‘post-conventional work’ under the banner of Integral Futures. His view was that conventional work was not making headway in the major pressing issues of the day and that a new way of thinking was needed – thus Integral Futures. One of the things that we can forget as futurists — or whatever our calling — is to challenge ourselves with the same urgency that we challenge our clients. It’s easy to reach a certain plateau in our thinking and work from there. Perhaps the most commendable aspect of Richard’s journey is that he has not rested on his laurels. Developing new ideas, theory, and approaches will make one a hero for some and a villain for others. Challenging conventional thinking usually makes more enemies than friends. But how else does a field move forward? Someone has to be willing to lead the charge. We are fortunate that Richard has been willing to do that throughout his career. This book will provide an up-close chronology of how he has continually challenged himself and his thinking. I’m sure some readers will reflect on their own personal chronology of how their thinking has evolved over the years. A class, instructor, book, or event often creates that indelible impression that lives on as one’s ‘turning point.’ Few of us will have the deep self-awareness that Richard possesses and openly shares with us. In reading his work, I’ve found myself in Bermuda looking at the birds, sitting in a classroom at the Australian Foresight Institute, imagining I’m in Boulder on the mountain with Richard and Ken Wilber (who sparked the idea of Integral Futures for Richard a decade ago), etc. I also relived some of the impassioned class discussions inspired by his ideas deep in the heart of Texas at the University of Houston’s Foresight program. 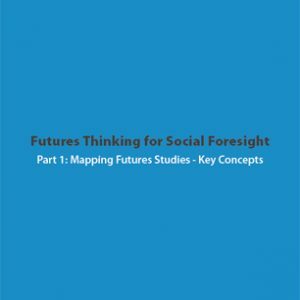 A key evolution of Richard’s thinking about the future is the necessity of putting the practitioner front-and-centre. His exploration into Integral Futures brought home the point that the role of human ‘interiors’ had been overlooked. 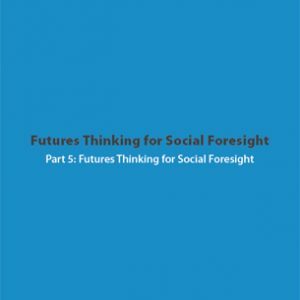 Futurists had tended to focus on ‘measurables’ because clients are more likely to be persuaded by hard data than intuition or interpretation. 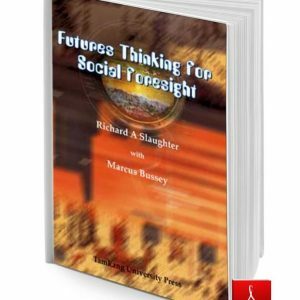 But this left a huge gap in the story, and much of Richard’s message, taken up by so many in the foresight realm, is to look for insight into the future by a greater study of the role of the individual in creating the future. 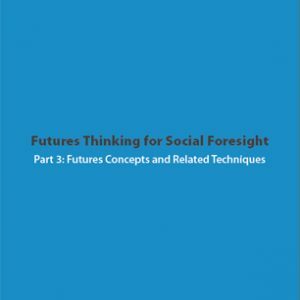 By that, he suggests that practitioners should undergo a critical self-examination of their own values, beliefs, and worldviews—not only to be aware of biases but also to strive for continuing personal development and evolution. In simple terms, in order to help others and society reach higher levels of development, practitioners must first be there themselves. Richard is a prime example of one who is continually questioning and pushing himself—practicing what he preaches. We have the benefit of seeing this development, which provides a model many of us will aspire to. And don’t be surprised if the seeds of a ‘Part Four’ have already been planted! Andy Hines, Houston, August 30, 2011. Terry Collins and Andy Hines, ‘The Evolution of Integral Futures: A Status Update,’ World Future Review, June-July 2010.